ITHACA – The Vassar women’s team (9-5, 3-0 Liberty) swept Ithaca (0-7, 0-2 Liberty) 9-0 and remain undefeated in Liberty League play this year. The Brewers swept Bard and Union in the fall season. Frances Cornwall and Tara Edwards teamed up for the 8-5 first doubles victory, and Melina Stravropoulos and Sarra Yekta tallied the 8-3 victory at the second. Meghan Rodick and Morgane Flournoy won 8-3 at the third doubles. 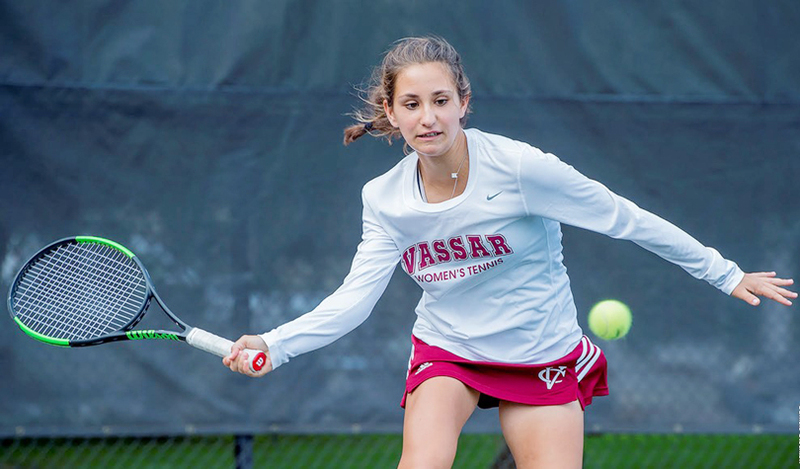 Vassar did not slow down in the singles play, not giving up a set in four positions. Cornwall only gave up one point in the first singles, winning 6-1, 6-0. Yekta won in three sets against Caroline Dunn. She took the first 6-3 before dropping 6-4 in the second. Yekta then edged Dunn 10-8 in the tiebreaker. Edwards mirrored Cornwall’s scores in the third at 6-1, 6-0. Flournoy took a tough four-set contest against Alexandra Dyszewski, besting her opponent 11-9 in the final. Freshman Joyce Park took a 6-3, 6-2 win at the fifth, and then Cara Kizilbash won 4-1 before her foe retired.